Birthplace : Little Rock, Arkansas, U.S.
Evanescence is an American rock band founded in Little Rock, Arkansas in 1995 by singer/pianist Amy Lee and guitarist Ben Moody. After recording private albums, the band released their first full-length album, Fallen, on Wind-up Records in 2003. Fallen sold more than 17 million copies worldwide and helped the band win two Grammy Awards and seven nominations, in addition, Fallen is #6 at the "Top Bestselling albums of the last 10 Years". Already a loner, Lee became a rebel as a teenager. She adopted a hard-line feminist approach to life and love, and she discarded her affection for pop rock stars like Christina Aguilera. With a sincere admiration for outrageous individualism, Lee acquired a taste for grunge, metal, and mosh pits. 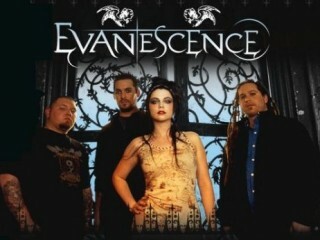 View the full website biography of Evanescence.